(From left) Zac Carvalho, Avery Cooper, Lily Oliver, and Cia Donohoe get a fire going at the Clara B. Winthrop Nature Reserve. MANCHESTER-BY-THE-SEA — The skies had opened up shortly after lunch, keeping most in the sleepy coastal town inside. But a group of Cub Scouts was just venturing out into the elements. 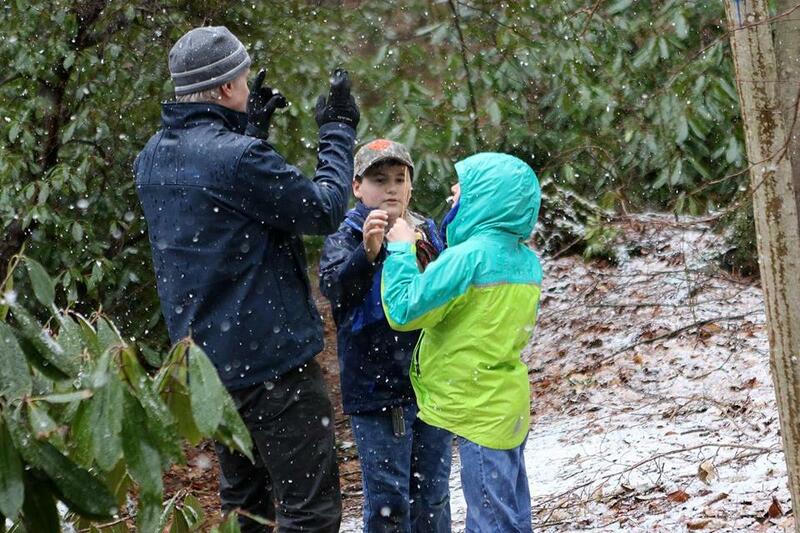 What made the group different from the Cub Scouts of the past 108 years was that among the five bundled-up fourth graders in Pack 30 was a pair of 9-year-old girls, Cia Donohoe and Lily Oliver. 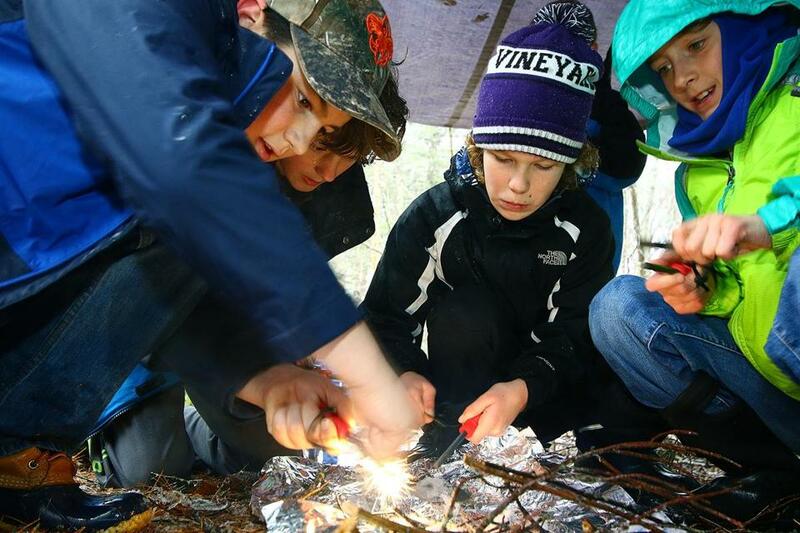 The den based in Manchester-by-the-Sea is part of the Spirit of Adventure Council, which includes troops in 75 Massachusetts communities from Milton to the New Hampshire border. It has joined the Boy Scouts of America’s early adopter program for welcoming girls, a significant step for an institution that has been criticized for being slow to adapt to changing times. While girls are currently being allowed to join the Cub Scouts for children 7 to 10 years old, they won’t be allowed to join the Boy Scouts — for ages 11-17 — until February 2019. The troops for older scouts will be divided by gender. More than half of the 272 councils nationwide have welcomed girls to the Cub Scouts. According to the Boy Scouts of America, over 3,000 girls have registered, though this number is expected to rise during spring recruiting, which is underway. Cub Master Todd Cooper shows Zac Carvalho and Cia Donohoe what kind of sticks to use for their fire. Donohoe and Oliver — both of whom were introduced to the organization through brothers and friends — said they were drawn to the boys’ group because they prefer the active nature of Boy Scouts to the comparatively sedentary one of the Girl Scouts. The boys, they had noticed, went to fire stations, slept on battleships, and took annual camping trips to to Singing Beach in Manchester. The girls, on the other hand, did a lot of crafts and sold cookies, they said. Sara Brea, who founded the Cub Scout pack at Emily G. Wetherbee School in Lawrence in 2016, said she pushed to include girls from the very beginning after seeing how much her daughter, now 7, loved all of the active outdoor activities. Now, her pack of 30 is about half boys and half girls. Last year, the Lawrence pack spent a week swimming, canoeing, and shooting arrows at Lone Tree Scout Reservation in Kingston, N.H. The scouts, who live in an urban area, had a blast trying all of the activities at the camp, Brea said. Denise Burgess, the chief executive of Girl Scouts of Eastern Massachusetts, thinks it is important that young boys and girls are allowed to grow and develop in single-gender environments. “The Girl Scouts have been around for 100 years. What we do is based on 100 years of experience and that can’t just be replicated overnight,” Burgess said. Back in Manchester-by-the-Sea, after scavenging the house for enough boots to cover all of the scouts’ feet, the group walked from den leader Michael Carvalho’s home along the road and down a path into the Clara B. Winthrop Nature Reserve. In the woods, the goal of the day was to learn survival skills. 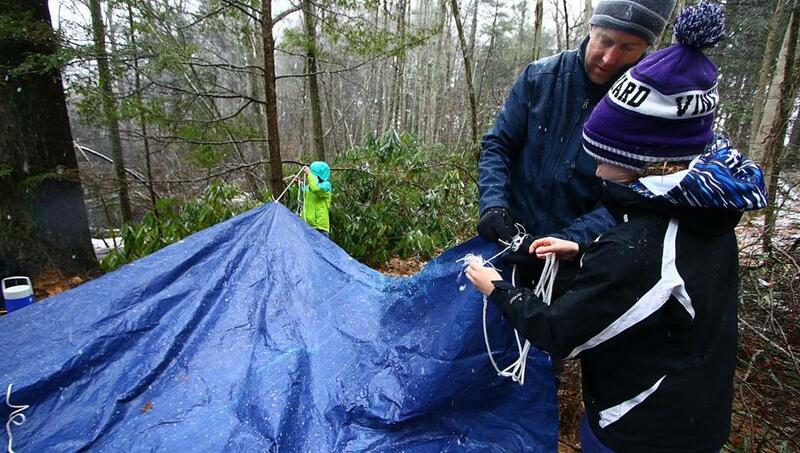 The scouts created a temporary cover by stretching out a blue tarp and attaching it with rope to nearby trees. Later, they huddled over a square of tin foil on the ground and struck magnesium sticks with steel scrapers to light bits of dryer lint on fire. Crouching shoulder-to-shoulder, they made tons of sparks like a fireworks display on the Fourth of July, the smoke from the fire mixing with the fog from their breath. To the boys in the den, the presence of the girls was a nonissue. Asked about his feelings on the change, Avery Cooper, Todd’s son, shrugged. Todd Cooper teaches Lily Oliver how to make a shelter. Julia Preszler can be reached at julia.preszler@globe.com.